An Iranian man has been diagnosed with an extremely rare and strange medical condition that meant he had hair growing in his eyes. The 19 year old had a cyst on his right eyeball measuring 5mm by 6mm that spoutde hairs. The man said he had been born with the cyst, but it had gradually been growing in size and the hairs were now affecting his vision. He was treated by octors at Tabriz University of Medical Sciences in Tabriz, Iran. ‘He did not have pain, but the mass caused vision defects, mild discomfort on blinking, and the intermittent sensation of the presence of a foreign body,’ said one of he doctors. Doctor’s managed to remove the cyst but regrettably the man’s eyesight has not improved. 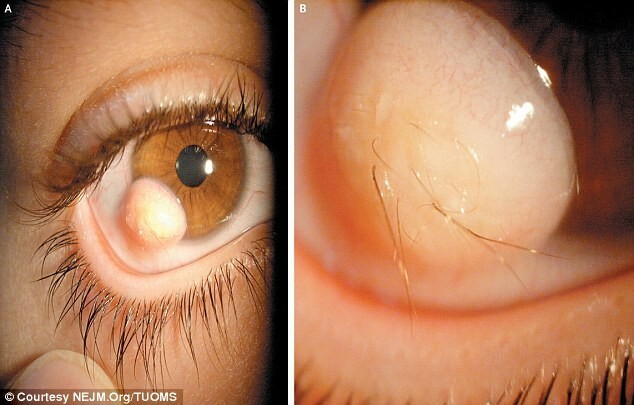 This strange hairy cyst is known as a limbal dermoid. They can grow can hair follicles, sweat glands and cartilage. In very rare cases, teeth can even form. However, its not known whether a limbal dermoid with teeth has ever been found on an eyeball. The biggest complication from limbal dermoids come from vision impairment. Because of the placement of the cyst on the eyeball, they warp a patient’s vision and can prevent sharp, clear eyesight from developing.